Mount Temple is the highest peak in the Bow Range of Alberta’s Banff National Park. It is an impressive mountain at 11,626 feet (3544 m) tall, which towers over the Lake Louise area. Climbing the standard route up the southwest ridge is not technically challenging, but does involve 5500’ of elevation gain, so it should not be taken lightly. Mount Temple is a great introductory climb for the Canadian Rockies. Make sure to get up early to beat the tourists to Moraine Lake, then hike the trail through Larch Valley to Sentinel Pass, before leaving the trail for a lengthy climb to the summit. Views all along the way are outstanding, but don’t plan on having them to yourself. As incentive to go on a 12-day family road trip through the Canadian Rockies, my wife offered to let me climb a peak during the trip. After a recommendation from my friend Michael, and much internet research, Mount Temple became the obvious choice. To start early, I actually took a cab to Moraine Lake for the start of the hike. It was already crawling with tourists (myself include), and for good reason. The sunrise on the Valley of Ten Peaks in the background was simply stunning. After a short distance along the lakeside trail, you have to stop at “the bear benches”, and gather groups of four before heading up the switchbacks, else risk being pursued by grizzlies or park rangers. It’s a popular trail for day-hikers, so finding partners doesn’t take long. I hiked with some guys from Utah and we had good conversation as the trail climbed steadily up switchbacks through the forest. Higher up there was another set of benches below Larch Valley where you can separate if you like. Once in Larch Valley, the views open up nicely. It also started raining at this point, in spite of the unusually sunny forecast. Mount Temple is known to have “active” weather, to the rain wasn’t too surprising. But it didn’t last long, and I made good time along the trail through Larch Valley to the little lake below Sentinel Pass. There were numerous folks on the trail in this area, and I passed many of them on the way up to the pass. From Sentinel Pass, there is a well-worn climber’s trail leading up Temple’s southwest ridge. I’d read the detailed climbing guide earlier, so the route was easy to navigate. In general, follow the trail, but stay on the left-hand side of gullies to minimize the chances of getting hit by a loose rock from climbers above. There was a good amount of fun scrambling along the way, including a 10 meter nearly vertical crux section about half-way up. I couldn’t find the way up at first, until I looked up and saw painted rocks up above. Once past the crux, it was mostly a scree/talus slog to reach the summit. I passed over a dozen folks on their way up, who were from all over the place, include Russia, France, Australia, and the US. The exposure increased near the summit, and I took photos for a group of young Aussies sitting on a cliff with some dramatic exposure below them. The summit itself was snow-capped, including a glacier stretching to the northeast. Views from the summit were amazing. The Canadian Rockies offer up some dramatic scenery, and I was in a good place to soak in the views while eating my PB&J. I’d made it to the summit in just under 3.5 hours, which was way faster than I’d expected. With some extra time on my hands, and feeling strong, I decided to descend and try for a second peak. My second objective for the day would be Eiffel Peak, which is an attractive 10,118 foot (3084 m) tall mountain located at the southwest edge of Larch Valley. I made good time on my way down Mount Tempe, passing dozens of folks on their way up. The climbers trail is much easier to see from above, so route-finding was easy. Once back down to Sentinel Pass, I merged in with the hordes of day-hikers for a while, before leaving the trail to head south toward the base of Eiffel Peak’s east ridge. 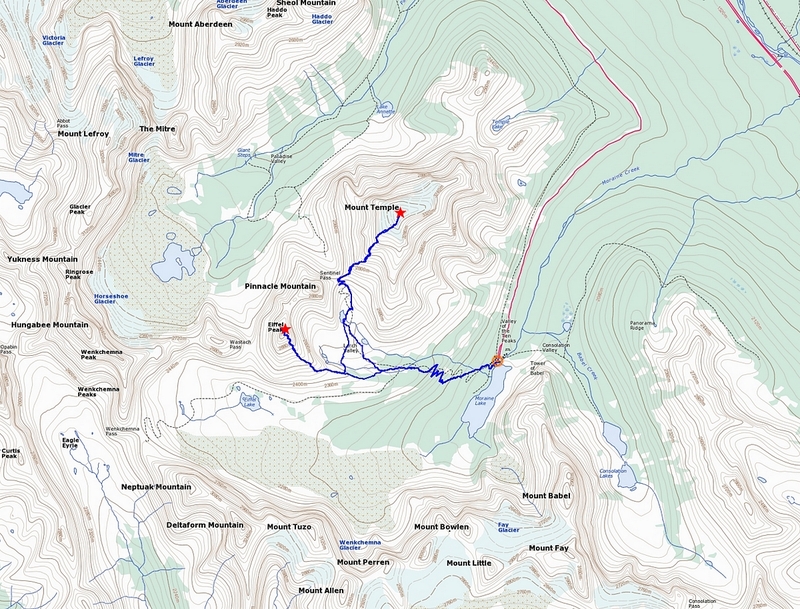 The off trail section on the way to the east ridge of Eiffel was forested with alpine firs and larches. There aren’t typically bears up that high, but I made plenty of noise and was glad to regain rocky open terrain on the ridge where I would be less likely to encounter any bears. The climbers trail down low on Eiffel’s east ridge was well cairned, and there were a couple other groups making their way down the peak, so finding the way was no problem. The only concern at this point would be time. I needed to be back to Moraine Lake to meet my family by no later than 6pm, and I was no longer moving very fast after 5500’ of climbing on the way up Temple, and 2400’ more to reach Eiffel. I decided my turn-around time would be 4pm, and continued plodding up the ridge. The lower portion is a bunch of boulder hopping, but higher up there is much more steep talus to deal with, including some pretty sketchy stuff in the last section below the summit. The descent from Eiffel Peak was tedious in the upper section, with small rocks over steep slabs. But I just took my time, and was glad when I finally reached the trail lower on the ridge. Soon the trail dropped back into the trees, and I did my best to loudly whistle “Amazing Grace” so as not to surprise any would-be omnivores. What a great day in the mountains. Amazing views, dramatic scenery, and some uncharacteristically good weather conditions for the climb. I was highly impressed with the area and can understand why Mount Temple is such a popular climb. Start of the hike, amazing view of Moraine Lake backed by Valley of Ten Peaks. First view of the summit of Mount Temple from Larch Valley. Mount Temple and the trail switch-backing to Sentinel Pass. Hikers climbing toward Sentinel Pass. Leaving the main trail to start the climb. Looking back down on Sentinel Pass. The route goes below these cliffs. View down from above the crux, multiple groups of climbers below. Paradise Lakes below Horseshoe Glacier and Hungabee Mountain. Larch Valley and the upper Valley of Ten Peaks. It’s a long scree slog to the summit from here. Final stretch to the summit of Mount Temple. Moraine Lake and Consolation Lakes from the summit of Mount Temple. Me on the summit of Mount Temple. Looking back on the biggest gully on the way down. Helmet recommended. Paradise Valley to the north. Starting up the east ridge of Eiffel Peak. Mount Temple from the east ridge of Eiffel Peak. The east ridge of Eiffel Peak starts getting steeper at this point. Loose rock on the scramble section of Eiffel Peak. Massive summit cairn on Eiffel Peak, with Mount Temple looming in the background. The impressive "Eiffel Tower" from the summit of Eiffel Peak. Moraine Lake, Fay Glacier, and Valley of Ten Peaks from Eiffel Peak. Final view of Mount Temple above Larch Valley, from Eiffel Peak's east ridge.